Wiley, our eight year-old Champion whom we adopted out this past summer. We visit him regularly & he’s always thrilled to see us… I cry for half the drive back home. I put my dogs’ needs ahead of my emotions. I work to avoid assigning complex human emotions to my dogs’ behaviors. Dogs are pretty simple creatures, if you think about it. They don’t hide their intentions or try to engage in high-level intrigue. If Chaos wants the steak off the table, Chaos’s either going to make a grab for it while I’m looking or he’s going to mill around waiting for me to leave the room – a maneuver she’s learned over time and one for which I’ve become prepared. Chaos isn’t going to sneak to the cellar and cut the power to the house, causing me to venture into the basement to check the circuits. That’s when Chaos shuts the door and locks me in, just so she can eat the steak. Chaos also isn’t going to intentionally leap under my feet at a precise moment and angle so I trip, fall and strike my head on the counter, thus enabling her to consume the steak while I lay either unconscious or dead. Thank goodness for Mankind (and me, in particular) that Chaos’s mind doesn’t work that way, or we’d all be scared witless of our dogs and their Hitchcockian machinations! The vast majority of dogs are simple in that they just need to be loved, cared for, given a share of quality time, housed well, and fed regularly. Notice that “fed” is last on my list? That’s because for most dogs, being loved and cared for is more important than even being fed. True. So, how do I let go of dogs I love? I love them enough to let them go. Although I stuff it down and don’t put it out for display, it always hurts tremendously when someone supposes that they would “love their dogs or puppies too much to let them go.” I assure you, it is precisely as a result of how much I love my puppies and dogs that I do let them go. If I kept them, it would be a grave disservice to every dog in my care, because then no dog would receive the appropriate love, care, and time s/he deserves. Have I given up dogs that I would’ve rather kept and cherished myself? Of course, but I did it anyway, because it was the right thing to do for that dog’s well-being and that is always paramount to me. This is what it means to put the dogs’ needs ahead of my emotions. 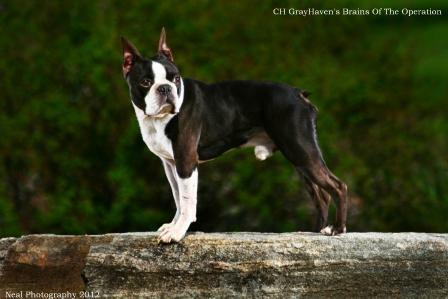 One of the first adult Bostons I had to place out was a nearly two year-old boy named Havoc who had become my Heart Dog. He was also my Velcro-dog. I was heartbroken over the need to place him, but he had proven to be deaf in one ear and I had purchased him as a show dog and breeding prospect, which couldn’t happen due to the deafness issue. In order to obtain another show prospect, I had to give up Havoc. I thought I’d dehydrate from crying in the days before his new mama came to get him. I fretted and worried and worried and fretted… All for good reason: Although Havoc loved Sandi, he did not love the idea of leaving the house without me to go with her. After a couple attempted draggings, I opted to carry him out to the car. He went in okay, but as soon as he realized I wasn’t getting in, all hell broke loose. He began leaping back and forth through the car, from window to window, screaming and crying, scrabbling and biting at the glass. I just sank onto the porch step and sobbed. The car pulled slowly out of the drive with Havoc yipping and flailing like a dervish in the rear window, frantic to get back to me. I wondered if I had just destroyed him. Several hours later I found an email from Sandi. She wrote that by the time they reached the end of our road (perhaps half a mile); Havoc was lying down calmly in the back seat gnawing on a Nylabone. He then fell asleep and snored the entire rest of the ride home… Havoc went on to bond very tightly with Sandi and is currently her Velcro-dog extraordinaire. He is none the worse for his dramatic parting from me. However, I on the other hand, learned a tremendous lesson from that crushing leave-taking: Dogs do not “feel” the same way humans do. Yes, they absolutely have emotions! No, they do not have the same type of complex emotions that people do. Havoc clearly didn’t want to leave me, but once I was out of his sight, he took comfort in his immediate surroundings and the people who offered him love and comfort. Would he have remembered me? Absolutely he would have, if I’d gone to visit him regularly. I know this from an eight year-old retired boy I placed with a wonderful woman here in our hometown just this past summer. Wiley knows my van when I pull in her driveway and he gets so excited! Even better, he’s a much, much more relaxed, happier dog at her home than he was at my home, which tells me I made the right decision to place Wiley with her. He’s always ecstatic to see me, which thrills me to the core, but he is also clearly quite content living with his new mom, which also makes my heart incredibly happy. So, how do I do it? I absorb the joy. When I get photos and emails and letters sharing huge Boston smiles and reports of happy puppy and dog happenings, they make every difficult moment, every shed tear worth it… Because I know my dogs are cherished, adored, treasured… Exactly the way I want them to be. And I know I’ve once again met my goal and have done right by my Bostons, in the manner God intended.